Haunted Houses as Physicalized Virtual Reality? It’s October. Sure, here in Chicagoland it’s been 80 degrees for the past couple days, but the leaves are falling, and the calendar can’t be lying. It’s October, which means every young person’s fancy turns to the ghouls and ghosts that go bump in the night. For the very young ones, this time means donning costumes and trick-n-treating to acquire a supply of candies to last a week. For the older young ones, this means costume parties and haunted houses. Not necessarily “real” haunted houses: you know, the type that Ghost Hunters and other “reality shows” investigate. In times of economic crisis, perhaps people turn more towards the paranormal as a comfort that something else exists out there to explain the good and the bad in their lives. Or they just like to be scared in a way that doesn’t involve thinking about how they are going to pay their bills month to month. Whatever the reason, there are a lot of paranormal shows out there, and a lot of people around the country making money providing tours of places that purport to be haunted. This, of course, goes on year long, but it becomes heightened during the Halloween season. Thus, during this month, otherwise friendly places become haunted zoos and haunted cornfields and haunted conservatories. But, more importantly, “artificial” haunted houses spring up in urban and rural areas. Largely done by acting students and young people, these “jump and scream” style horror houses are good for 30-60 minutes of immersed horror. Within the walls, or the rows of corn, costumed people and staged horrors are meant to recreate the fear one typically only experiences by watching a horror film or reading a horror book or playing a horror game. In other words, you willingly (even if you “protest”) enter these spaces because they are virtual places: they are the physicalized representations of otherwise fictional content. These spaces are created with the sounds, smells, sights, even taste and touch sensations, that would normally only exist in horror media. By stepping into the space, you are immersing yourself in a representation of the otherwise mediated experience. In other words, these haunted houses are analogous to virtual reality constructs. They slip that line between what is real and what is virtual by infiltrating our mind through our senses. They are physical representations of what virtual reality has attempted to produce by transporting us into the digital. With haunted houses, the digital is transported out to us in the physical. And haunted houses are now doing their transportation by further eroding that line between the real and the virtual. Digital technologies, such as animatronics and video, are bringing into the real of these haunted houses the unreal, of actions not produced by physical objects or people actually present in that space. 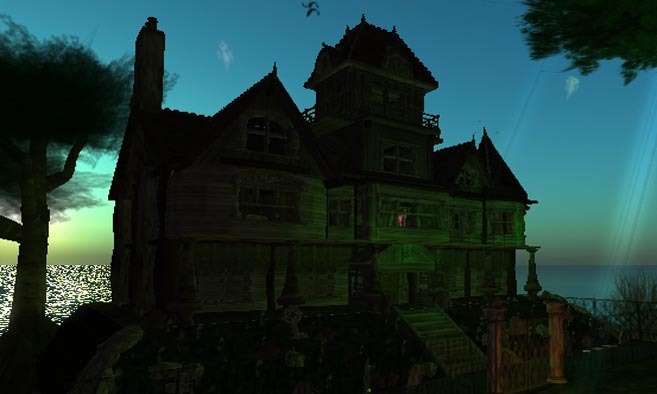 Additionally, haunted houses are now in true virtual reality technologies: virtual worlds, such as Second Life. These virtual constructs are representations of physical constructs that are representations of virtual constructs. But do they offer the same type of experience that a real haunted house does? In real haunted houses, the fear comes from the immersion of the physical body in a physical space representing horror. There is no such immersion in a virtual haunted house. However, in both, there can be a psychological immersion if the tricks of the haunted house are convincing enough. Such as the fear from a horror media can be great enough if the media is well produced. All this being said, I think come next fall, I’ll have a whole new research project to get off the ground. Anyone interested in touring haunted houses with me?